The San Diego Chapter of AFP, chartered in 1974, is part of a vital national organization of over 30,000 fund-raising professionals. The San Diego Chapter is one of 230 chapters around the world. Current membership in our San Diego Chapter has grown to 400 members in development and related fields, who represent organizations located in San Diego and Imperial Counties. The primary purpose of the San Diego Chapter is to educate and advance the careers of those in the rapidly changing field of development. The Chapter promotes ethical standards, provides a network for members, lists local, regional and national employment opportunities and offers a pool for consultant services. AFP, an association of professionals throughout the world, advances philanthropy by empowering people and organizations to practice effective and ethical fundraising on behalf of the community. The San Diego Chapter of the worldwide Association of Fundraising Professionals (AFP) upholds the mission of the international association and advances philanthropy in the San Diego region by enabling members, prospective members and representatives of other organizations to practice effective and ethical fundraising. The Chapter fulfills its mission through education and training, promoting credentialing, providing resources, networking, mentoring, advocacy and recognition. Members of the San Diego fundraising community started the region’s first professional development organization in 1970: NSFRE, the National Society of Fund Raising Executives. 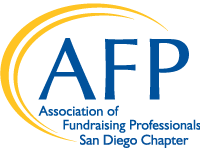 In 2001, the organization changed its name to the Association of Fundraising Professionals, and the local chapter is now: AFP-San Diego. For the past 45 years, the organization has developed programs to build the credentials of its growing membership, network the fundraising community and recognize outstanding contributions to regional philanthropy. The group has also fostered the development of other chapters (domestic and abroad) and fundraising organizations. AFP San Diego Chapter has distinguished itself with leadership on the national board by San Diego members, including the highest office, AFP-International Chair. The San Diego chapter has also been in the spotlight as host of the international conference, as recipient of awards for exemplary programs, and for new path-breaking initiatives. At present, AFP San Diego Chapter has more than 300 members, a 25-member board of directors, and is incorporated as a nonprofit organization. Monthly chapter meetings feature outstanding figures in philanthropy. Workshops and training opportunities develop professional fundraising credentials. The annual, local celebration of National Philanthropy Day. The annual AFP-International Conference also draws hundreds of participants from across San Diego. Through its affiliation with the international Association of Fundraising Professionals, today’s AFP San Diego Chapter members are connected with 30,000 members in more than 230 chapters throughout the world, working to advance philanthropy through advocacy, research, education and certification programs. THEREFORE, IT BE RESOLVED, THAT AFP SAN DIEGO is committed to diversity as an ongoing proactive process in its governance, chapter, committees, membership programs and activities. AFP San Diego defines diversity as the seeking and achieving of a broad representation of experiences, perspectives, opinions and cultures. Inclusiveness is an essential source of vitality and strength for the effective pursuit of an organization's mission. Inclusion makes our profession stronger. At AFP San Diego, we have a multitude of professionals from diverse backgrounds who bring a richness of knowledge, expertise and experience to our profession. Cross-pollinating ideas among those from diverse backgrounds fuel innovation and keeps us sharp. Diversity and inclusion is a cornerstone of AFP San Diego’s values that guides our governance, our organization and our programs. Diversity is the seeking and achieving of broad representation of experiences, perspectives, opinions and cultures. Inclusiveness is an essential source of vitality and strength for the effective pursuit of an organization’s mission. We walk the talk on inclusion. Through our programs, AFP San Diego facilitates dialogue among many voices as we share observations and practices with our peers.